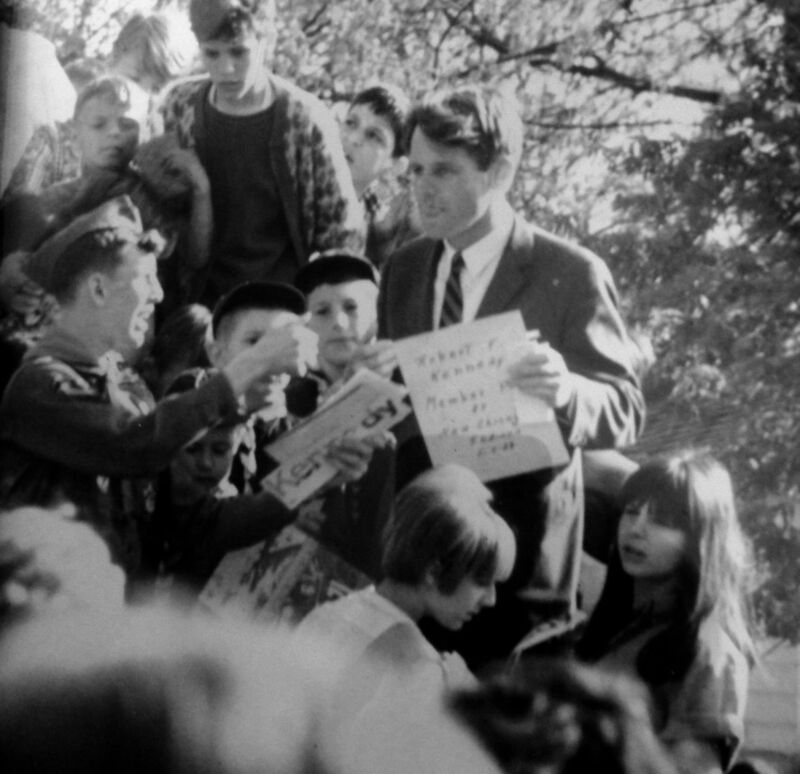 Robert Kennedy made a campaign stop in New Chicago on April 30, 1968, at the Fire Station on Michigan Street and Huber Boulevard. Kennedy was assassinated in California just weeks later. Our Savior Polish National Catholic Church was built in 1939. The New Chicago Library is pictured in 1969. It has since closed and merged with the new library location in Lake Station. NEW CHICAGO — Paul Leon Wolek was serving as the first town marshal in 1953 when Julie Wolek first met her future husband. Leon Wolek, as he was commonly known, also collected the town's garbage and ran the street department in New Chicago at that time. "He was everything," Julie Wolek said of her late husband. Wolek, 83, who retired last year as Hobart Township Assessor, recalls getting married in 1954 in a Polish Catholic Mass at the Assumption of the Blessed Virgin Mary Catholic Church. "That's where we got married and where our sons and grandchildren were baptized," Wolek said. New Chicago, which is between Hobart and Lake Station, was incorporated as a town in 1908, according to information on the town's website. The town is one square mile and includes the New Chicago Town Hall and police department, a volunteer fire department, water department, three parks, the River Forest Community School District and about 40 businesses. Most of the development came in the 1950s, after World War II, Wolek said. "It was just a bedroom community and still is," Wolek said. The town attracted a great number of Polish-Americans from the Chicago area who built small homes there in the 1930s. "It was a summer resort for them. They would come for the weekend as their retreat," Wolek said. Many of the houses were built in the mid-1950s, near the site of what is now River Forest High School. The small homes, many in the 600- to 800-square-foot range, are what Wolek calls spindle homes. "There's a whole section of spindle homes," Wolek said. Town leaders decided a school was needed, so residents sold bonds and mothers walked door to door selling bond to assist in the drive. "The school was built on land that had been used as a baseball field," Wolek said. River Forest High School, established in 1958, had 653 students enrolled in the 2013-2014 school year. Wolek, who now lives in Hobart, said her New Chicago house was a hub of activity in the 1950s because it served as her husband's office. "If you had to call police, you called our house because it was also my husband's office," Wolek said. Her husband, who served as the Hobart Township assessor for 36 years before stepping down, also had the town's American Legion named after him. Wolek said she and her husband opened the town's first bowling alley on Michigan Avenue. "We built it and later sold it," Wolek said. The Town Hall was once a one-room school, Wolek said. One of the more exciting political events to occur was in late April of 1968 when Democratic presidential candidate Robert Kennedy came through New Chicago. His whistle stop campaign in Northwest Indiana included a brief stop at the New Chicago Fire Station at Michigan and Huber, Wolek said. "He (Kennedy) would be assassinated in California a short time later," Wolek said. There are 650 homes and 2,063 residents in New Chicago, according to Deputy Clerk-Treasurer Rebecca "Sis" Williams. Williams said that leaves very little wiggle room for any new commercial growth. In 1836, Henry Fredrickson and John Chapman purchased land from the government on the Calumet River. The land on which New Chicago is located was platted by these men in that year on what came to be called Liverpool. Stores and hotels were built to serve travelers on the Michigan City–Joliet stage line. George Earle, an architect/builder and early resident of Liverpool, was instrumental in having Liverpool named as the county seat. However, in 1840 a new committee appointed by the legislators moved the county seat to Crown Point, and the old courthouse was sold and floated down the Calumet River to be used as a tavern in Blue Island, Ill. After the loss of the county seat, Liverpool stopped its growth. In 1851, the Michigan Central Railroad was complete through the northern part of Lake County. The railroad closely followed the old Indian trail, and a depot was erected. Rapid growth followed, as New Chicago became the center for Lake County with the building of the Joliet and Northern Indiana Railroad. The construction of other railroads and other stations slowed growth in New Chicago. The outlook for growth brightened in 1906 when U.S. Steel Corp. began platting and building Gary. Property owners saw the growth of Gary and thought of a suburb outside of the city as a community that might become the home of some of the officers, executives, department heads and professional staff of the steel and other industries. Future growth is difficult in this tiny town of 2,063 because it is landlocked and because officials must work within a tight budget, New Chicago Deputy Clerk-Treasurer Rebecca "Sis" Williams said. It's because of those financial confines that officials are banking on the possibility of replacing existing aging infrastructure, such as the Town Hall and fire station, through grants. "We're going to try and get a grant for a new fire station maybe down the road," Williams said. "We only have one fire station, built in the 1950s, and the trucks barely fit into it. The volunteers have to pull it outside to get on it," Town officials aren't hopeful of getting a grant because they've tried and been turned down numerous times for a fire equipment grant request. "We applied three times to get a grant but each time we were denied. We're not big enough to qualify, and we have an all-volunteer department," Williams said. "In the future, we'd also like to look at getting funds for a new Town Hall. Right now, the Town Hall isn't handicap accessible. Our chambers, where town council meets, is accessible by ramps." Williams said. Town officials have had success with obtaining grant money from the Indiana Department of Transportation to add a "smart light" to the busy intersection of Michigan and Huber. The light allows children going to school to push a button to cross safely and allows school buses to go through. "It took us two years to get it up. We're so proud of that light." Williams said. Town officials have continued to upgrade and make improvements to the three municipal parks and hope to add a community center. "In the future we hope to get a pole barn at the park so we could hold small weddings and showers to generate money." Williams said. Town Council President Pam Richard said a tight annual town budget of about $350,000 makes it difficult to make any major improvements. Richard agrees with Williams that the only way officials can hope to build a new town hall or fire station or make improvements is to obtain grants. "We have to do something to the existing town to make it ADA compliant." "We were excited this year because they didn't cut our budget by $50,000." Richard said there's little room for residential growth because of the town being landlocked, but there is at least one builder giving her some hope. "One resident is building new homes on the northeast side of town off of Tyler." Improvements need to be made to some of the older existing houses that are unkempt and rented, not owned, Richard said. "We have started working with landlords. I'm trying to make them accountable to rent to better clientele. We're trying to get young families in our town or it won't keep going into the future."